Appeals raise funds that further mission. And when executed well, they do much more. They also help sustain long-term donor loyalty. Your choice of words matters. Consider this appeal for Concordia University, Nebraska. 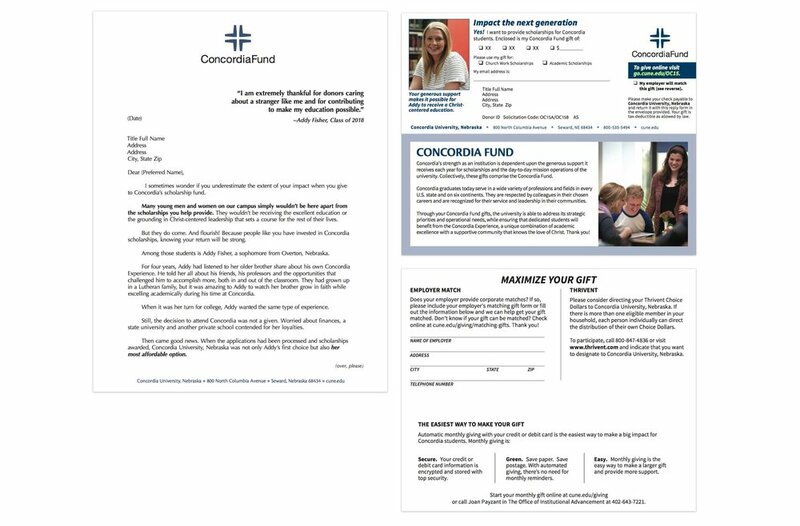 Powerful quotes from a student include: “Receiving scholarships made it possible for me to attend Concordia.” The student, in her own words, expresses appreciation for the donor’s generosity and reinforces the essence of the appeal: to impact the next generation through gifts for scholarships. Beyond measuring the success of individual appeals, Meyer Partners monitors donor-centric metrics on a regular basis. Four weeks after this appeal mailed, giving to the university’s annual fund was ahead of the prior year by 13 percent.